We see Senators Favero, Palaiologos, Gael, Doukas, and Angelos here. Let us hope we hear from the others soon. First of all, We blame the obstructionism of the bureaucracy for these events, as they prevented Our father and Grandmother from properly meeting the people’s needs. Senator Doukas, you will ensure the bureaucracy adheres to any reforms we pass. Use whatever means are necessary, this is a time of emergency. 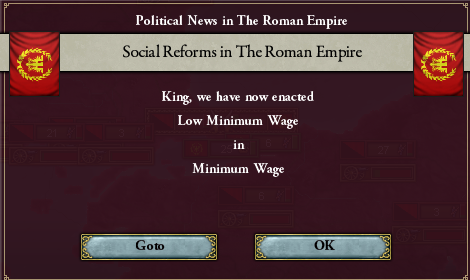 The first reform will be an increase in the minimum wage throughout the Empire. We need workers able to provide for their families. See if you can dissuade those who wish for voting rights. We will ask the humanities department to better develop their methods of understanding society so that We can heal the hurts that have caused these events and will be caused by these events. Senator Palaiologos, We accept your offer to be placed in a battle command. We will determine the details of your posting in short order. The first priority will be extracting the legions from hostile territory. They must regroup before we strike back. We will call a meeting of the Senators as soon as there is enough news for an update. “UNLIMITED POWER!!!!!!!!!!!!!!!!!!!!!! !” screamed the emperor. “As you wish, Your Imperial Highness,” said Theodora, bowing. “Yes, Your Majesty,” said Ioannes. The doors to the headquarters swung open, and in walked Theodora in official robes, flanked by at least three dozen Varangians. “As you wish, sir–I mean, ma’am,” said Cody. No one was really sure what had happened with Nestorius Septiadis. Following his ascension to the position of Governor of Naples, he mysteriously disappeared from the Senate. Rumors arose of his possible assassination not long after, followed by rumors that said rumored assassination was done by cultists. But the truth is much farther and more simpler than that. Nestorius has simply been in Naples this entire time. In the years since becoming Governor, he has primarily concentrated on Naples, having moved there almost as soon as he became Governor. He had received countless letters from the Senate, telling him what had happened there and asking him to please attend the next session. The last time he had opened one of those letters was back when Empress Veronica passed away. Everything he knows about the events at the Senate from that point onwards he figured out through hearing what the people in Naples are discussing about. News of the Civil War spread quickly through Naples. Nestorius was organizing documents when an assistant informed him of the news. “A Civil War? !” he yelled to the assistant, shocked to hear that after all the revolts, the various independence movements had finally decided to step up. After being handed the newest letter from the Senate, Nestorius scratched the beard he had grown during his governorship. He couldn’t believe the magnitude of the situation. He knew what he had to do. “Get my coat and check for the next boat to Greece. I believe it is time I finally returned to the Senate,” he told his assistant. Nestorius turned curiously and nodded. “May I accompany you?” Hairini asked. Nestorius blinked for a few moments, remembering what he had read about her. “You wish to see the splendor of the Empire, yes?” he responded. Hairini nodded. “I have only been to a few cities in south-western Asia Minor, as well as Athens, before being assigned to work in Naples. For all I have done, I believe it is fair,” she responded. Nestorius stood there for a moment, unsure of what she had done because of how he hasn’t paid attention to those working under him. After asking her, she revealed that she, along with a few others, have been the main pushing force, the ones who answer to him directly and those who give out the commands. He ah’d for his lack of awareness. “Call them here then,” he told her. A pseudo-meeting had been made, as Nestorius addressed them. “As you all know, a civil war had broken out across large stretches of the Empire. Because of this, I’ll have to head for ‘Polis and rejoin the Senate after so long,” he told them, as they all nodded. “This lady here……. Hairini, was it?” he asked, to which she answered with a nod. “Hairini here tells me that you all have been answering directly from me and keeping this place together as I worked and worked from the top. To that, I wish to thank you. I get carried away in my work and sometimes forget about the things around me, so I am very grateful that you have all helped me thus far,” he told them, causing them to smile. Nestorius pauses for a moment, thinking over what he was going to say next. He wanted to finish the meeting, but Hairini wished to accompany him. As he thought it over, he decided to allow it….. that is, until he noticed a book she was writing in. He asks her to hand it to him, which she reluctantly does. Nestorius flips through the pages and find….. a journal, describing Hairini’s journey since leaving home. He handed the book back to her. “I plan on releasing my journal as a sort of autobiographical story when I stop working in the future,” she revealed. “An aspiring writer?” he asked, to which she responded with a nod. Nestorius smiled, remembering his own travels around Europe and the Middle East when he was young. He was sure of how he was ending the meeting now. “Alright, I believe that’s it for this impromptu meeting. Hairini, pack your things. We mustn’t be late for the next ship to Greece,” he stated, as Hairini couldn’t believe her ears. She nodded furiously and immediately headed to pack her things. Some 15 minutes later, she was ready. Nestorius and Hairini bid the others farewell as they headed to the nearest port. This last week began with the declaration of the civil war. All legions in enemy territory immediately began moving to the nearest port, with the exception of the legions in the vicinity of the Alps, who instead began marching for the eastern Alps. Several other legions had been fighting rebels throughout the Empire, and they continued to do so. Many of the legions seeking to retreat to ports were ambushed by what had been their comrades just days before. Others just never resumed communication and are completely missing. And even today, there are new attacks from within the Legions’ own ranks. The Western Mediterranean Fleet is escorting Senator Nestorius’ ship to Constantinople. We expect his arrival on the second of June. We would not have summoned you for such an indefinite update, but We have received yet more troubling news. Russia and Germany have signed an alliance. Worse, in their announcement, they have specifically referenced Our current troubles. Senator Palaiologos, We apologize for not yet giving you a command, but We wish to know what forces We have available first. My Emperor, it is fine. 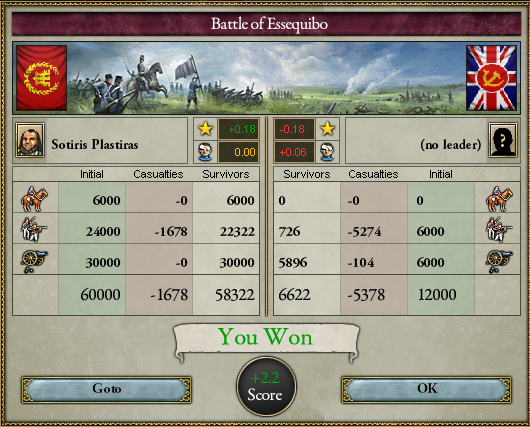 I prefer to lead the remaining legions in Britannia to victory against my cousin, Henry Palaiologos. He has betrayed this Empire and is a die- hard communist. I will personally lead the war against his forces and hope to achieve a victory and bring him to you. The crew member stood there in silence for a moment and leaned forward. He whispered something in his ear, something Nestorius would yell loudly: “PEOPLE THINK I WAS ASSASSINATED? !” he yelled out. The crew member attempted to shush the surprised senator, but only with Wataa’s help was that achieved. “How about you send a message to the Senate and inform them of our plans to arrive?” she asked politely. The crew member straightened up and rushed elsewhere. The two hoped nothing bad will happen. Thankfully, nothing bad happened. The crew member returned to tell of how the Western Mediterranean Fleet will be escorting the ship now, because of their presence. They thanked the crew member for his hard work and went to their room. Nestorius laid in his bed, still under slight shock over the fact that people have thought he had been killed years ago. Soon, that thought subsided after he realized that he barely remembered anyone at the Senate; he’d only hope someone recognized him when the two arrived. Hairini was very much more upbeat, as she continued writing into her book. While the two would attend meals onboard, both spent their times mostly in their room. One evening, off the coast of the Peloponnese, Nestorius was alone in his room, having calmed himself slightly over the rumor by reading some literature. At one point, he noticed how he was in fact alone. If Hairini, a native from Aoteorea, were to do something obscene, it would be his neck in the yoke. Swiftly, he put the literature down and headed to the deck to look for her. Almost instantly, he found her near the railing, staring out at Hellas. He slowly approached her and joined in. “How long have you stared out at the coast and sky?” he asked. “Heh…. I’ve lost count,” she responded, to which he responded with his own little laugh. “You could’ve told me that you’d be gazing tonight. I would’ve joined you,” he said with a smile, which Hairini responded with another little laugh. The two gazed out and talked about their respective motherlands; while Nestorius hadn’t missed Greece much, as he had seen it all, he did miss Hadrianopolis, as well as Dyrrhachion. Hairini made many comparisons when reminded of home, which Nestorius noticed. “You miss your home, more than I miss mine, hm?” he asked. She looked away from a moment, unsure how to respond, before turning back towards him. “I do. I really do. But I am here thanks to my home…. and my family,” she said. She spoke of how the other big reason why she was working overseas was that she was supporting her family back home, and she spoke of events of discrimination she and her family had faced. “There are many kinds of people in this world, Hairini. Remember that,” Nestorius commented. “I know, I’ve met one right here,” she replied with a smile, which slowly faded. “Well then, Cyrene, I believe we’ve gazed enough. We should go to sleep,” Nestorius said with a smile. The two returned to their room and went to sleep. Bah, Communist scum! Once more, they have betrayed this Empire. 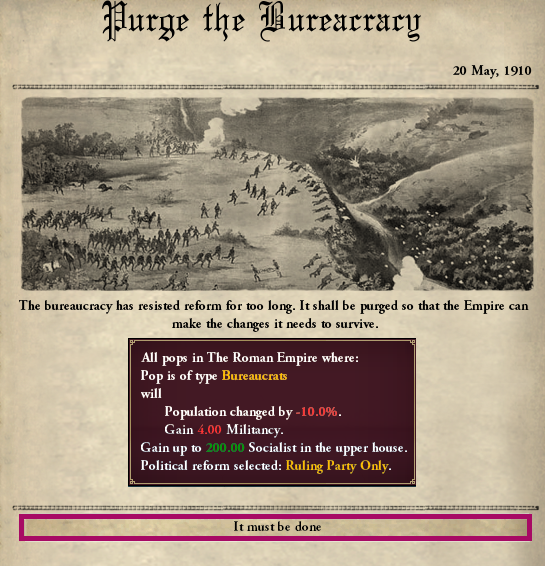 I petition the Emperor to pass a law outlawing all Communist parties in this Empire! They are a blight on this Empire and seek to bring it down at all costs! We must seek a final solution to this problem, I propose that any Communist found after this law is passed will be sentenced to either life in prison or execution on the charge of treason. I am currently conducting a fighting retreat through Britannia. My, I am ashamed to call him this, cousin is in Londinium right now conducting operations against us. But our legions are strong and tough, we will not fall easily. Attrition is slowly whittling us down right now and the rebel is conducting ambushes at every corner. I have received information that our Communist former colleague is the linchpin of the Communist rebellions. I have dispatched several elite soldiers to try and … take care of him. Alas, I fear Britannia will be lost soon. I am pleased to announce of a Communist brotherhood against the imperialists to resist all attempts to forcefully subjugate the proletariat. Together, we shall stand strong and united against the capitalists who seek only to exploit the hard work of proletariat so they can eat and drink it all away. Together, comrades, we shall bring down this decadent, oppressive Empire called Rome! Together, we shall export the Revolution elsewhere and spread equality and liberty throughout the corners of the world! Our comrades, the Gray’s, are currently marshalling Communist forces in Brittany. Comrades, I ask you to follow me to destroy the weak, retreating forces of the oppressive monarchy called Rome. Comrades, I ask you to spread progress throughout the world! The final solution to the communist problem should be to deny them anything that could boost their argument. We could implement social reforms that they desire so that they cannot use those to gain credibility. Of course, some reforms, such as the abolition of the monarchy, are too radical and treasonous to even consider, and we should execute any who support those ideas as traitors. Yes, of course, I agree completely with you. But we must also suppress such revolutionary tendencies! Your concerns are understood, general. It is my job as Megas Domestikos to ensure that revolutionary tendencies are and will be suppressed. Finally, the nearby rebels have been driven from the vicinity of Constantinople. Yet again, the walls held firm and the Scholai Palatiane won the day. Likewise, the half of XXIII. Legio in Burgundy has fought free of their foes and is expected to reach the city of Amsterday by the sixth of June. They have reported that Burgundy is led by someone claiming to be the Pope. For those who don’t remember, the Pope was the Bishop of Rome when the Latin Rite had begun to separate from the Church, who had claimed primacy over the other Patriarchs. When the schism was ended, he fled to the few countries that still supported the heretical movement, and eventually there was no more word of Popes after all nations turned back to the church. We do not know whether the succession of Popes continued in secret, or if this is someone merely seeking anything that would provide a claim against the Empire. In sad news, We received word that VII. 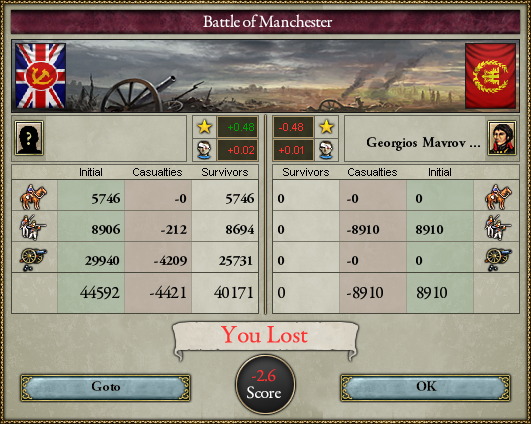 Legio was completed defeated in the battle of Manchester. No organized forces are reporting in from Britannia, and We fear that all have been lost. A small smattering of VI. Legio has escaped enemy forces and hopes to escape to La Rochelle by tomorrow. Likewise X. Legio, heading for Ghent. A large enemy force in Pozega, in the Balkans, is primed to crush XXVII. Legio, but XXIX. Legio should be arriving tomorrow to aid. The remnants of XI. Legio have escaped from Australia and are under way for the nearest port in the Cocos islands so that their transports can be used to extract XXXXII. Legio from Java. Many other rebel forces have been defeated, but it is too early to fully know what forces have escaped, let alone what forces will be ready when we strike back. But something yet more strange has happened. 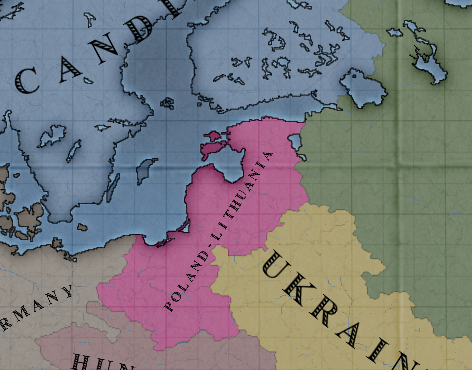 Both Russia and Germany have ceded lands to Poland-Lithuania in order to draw them into their alliance. This may yet be cause for worry. The ship carrying Nestorius and Hairini arrived as scheduled in Constantinople on the 2nd of June, but circumstances delayed it to arrive in the late evening. The two grabbed their things and got off, as they entered the City of the World’s Desire. Nestorius took a deep breath, as he let the smells of the never-sleeping city surround him once more. “Ah, the Queen of Cities, how long since we have parted?” he thought aloud. Hairini looked around herself, as she saw the spectacle that was the Reigning City. She pulled out her journal and immediately began writing descriptions of the capital. Nestorius looked over to her, laughing slightly. “Cyrene, you’ll have enough time to explore and write later. For now, we should find a place to rest at,” he told her. She turned to him and nodded, putting her journal back. They quickly found a place to rest for the night. In the morning, the two prepared themselves for the departure to the Senate. “Do you think the senators remember that you exist, Nestor?” Hairini asked. Nestorius paused for a moment. “….Hopefully?” he said in an unsure manner. Hairini responded with a giggle. “Well, I doubt you remember many of them,” she said slyly, causing him to laugh in a confirmational way. Eventually, they got ready and left. Arriving at the Senate, the two were stopped at the front of the building by two guards, asking for their identities. Once Nestorius revealed who they were, they were allowed in. They then spent the next few minutes trying to find where the Senators were before finally locating them. They quietly entered the room and put their things on the coat rack, as Nestorius tried to identify one of the senators before they identified him. It is my duty and my sadness to report to the Imperial Senate and the Emperor of General Palaiologos’ condition. He personally supervised the defence of Manchester against overwhelming enemy forces and was shot twice, once in the arm and once in the chest. He is grievously wounded, I do not know if he will survive. The second in command, General Georgios Mavronis was killed by an artillery shell. Imperial forces are in full retreat, the Seventh Legion is gone. 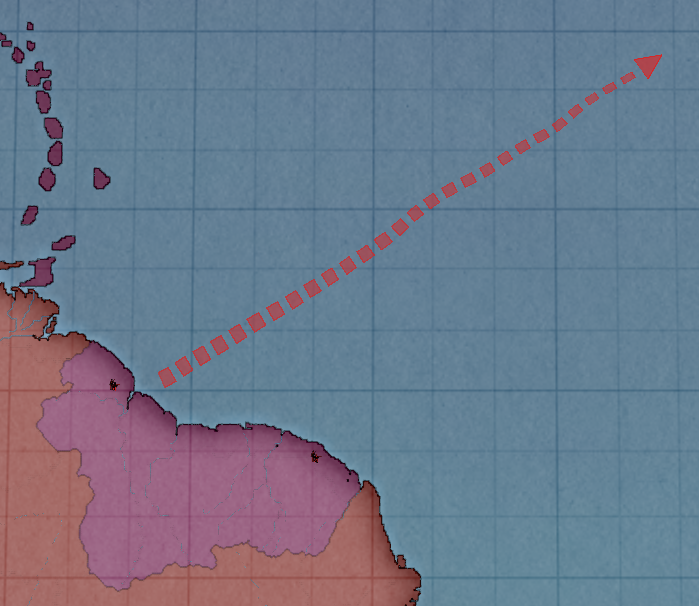 General Durranis is currently leading the remnant of the Tenth Legion to the coast near Ghent to be picked up by the navy. I am leading the Sixth Legion to west coast to be picked up by the navy. I do not know if we will survive. No-one knew what happened to Marco during the first months of the civil war, but Marco had some rage to take care of. Once news of the Civil war hit, he didn’t even warn the senate he was going to wales to ‘give those chaps a right talking-to’. all he did was leave a short note to Sarah and Gabriel. The recent war has made me quite….annoyed, so I am going over to Wales to join a loyal resistance group and do some sabotage. I shall soon return, donut fear. Once two weeks had passed, Julius decided that he had quite enough of killing and blowing up supply lines. 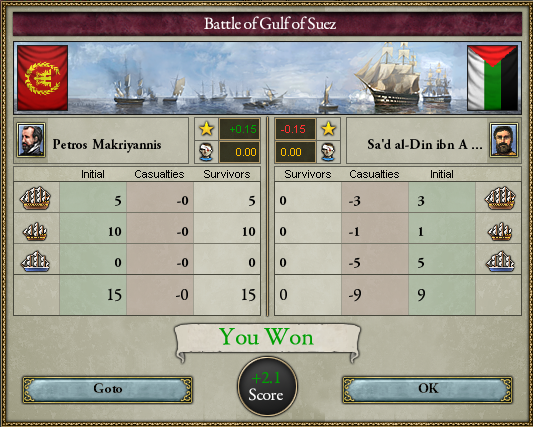 He got a ship to Constantinople, and managed to avoid enemy patrol ships. As of right now, he is currently in the senate building trying to find everybody. Nestorius was unsure what to think. He didn’t recognize anyone. He couldn’t even locate the Senators he would’ve assumed to be here, such as Comminus, Smithereens or Komnenos. He became very nervous over approaching the others, but Hairini re-assured him that things would be alright. Nodding in response, the two slowly began approaching the others when, out of nowhere, Senator Marco appeared. Nestorius looked at him for a moment before realizing he had never met him before. He slowly turned back to the other senators and continued approaching them, as he tried to find his seat. As Nestorius found his seat and got an extra one for Hairini, he overheard senator Alexios speak. “You could say I’ve been late for some 30 years,” he quipped. Unfortunately, I was only able to get my hands on a letter, and liberate a few villages, plus a small town. Do you have this letter with you? Which towns and villages did you liberate? I need specifics if we are to eradicate the rebel scum! All I can say is I am most grateful I was not at my estate outside Venice when this whole calamity started. Both my father and grandfather were murdered on its premises, and likely I would have been the third. 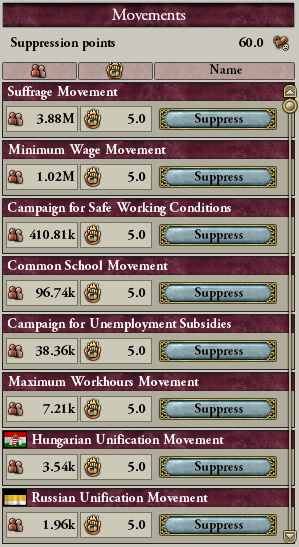 I can only imagine what those filthy separatists are doing to my estates right now. The poor vineyards. Nestorius and Hairini just watched the other senators talk with blank expressions. The former was unsure how to go about not only introducing himself to the rest and explaining his absence, as well as figure out what had happened since the death of Empress Veronica, while the latter was just nervous, unaware of how the others would react to a native from a rebel state. But she knew they had to contribute. “Come on, say something,” she whispered to Nestorius. “You think I’m not trying, Cyrene?” he replied with his own whisper. He decided to draw attention to himself with a few strategically placed coughs. Perhaps someone might realize who he was, considering the fact that they had contacted the Senate before setting off from Naples. A quick rundown on major events. The Emperor was assassinated by the Cult while on a visit to the Caucasus. My father gave his life to prevent more deaths. Unfortunately, as you know some provinces have used this as an opportunity to rebel from the Empire. Do not be afraid. You are in the Senate now, in the center of the City of the World’s Desire. You are safe now. There is no war within Constantinople, only outside. United we can triumph over the rebel scum that refuse to acknowledge their Emperor as their true ruler. Nestorius rubbed his face before nodding. “I see. I’m sorry for your loss,” he said in a slightly saddened tone. “I assure you, my loyalty to the Empire is as strong as ever. Same goes for my assistant,” he stated, as he realized that she hadn’t introduced herself. He turned to her and motioned her with his eyebrows to introduce herself. She got the message and stood up. “I believe I haven’t introduced myself yet. My name is Hairini Waata. I work under Senator Septiadis back in Naples. It is an honor to be here,” she said, bowing towards the senators. I did not read the letter yet, as I thought it would be of better use for the minister of security, so I do not know whether this is a communist leader order or some love poetry. As for the towns… let me see… Bangor,Cardiff and Vale. Hairini sighed in relief, knowing that she had been accepted by those in the Senate. Nestorius smiled, before returning to a worried expression once he heard about Theodora’s missing brother. As he was about to express his own opinions on rebel punishment, Theodora spoke of the Northern Alliance. Nestorius looked like he had just heard of his mother’s death. He once more rubbed his face. “Very distressing, to say the least,” he said, with Hairini nodding in agreeance. “We must however concentrate on our own affairs before doing anything about this alliance. If we do not at least have the mainland of Europa under our control once more, then we are doomed in the face of war,” Nestorius expressed his thoughts. I am the Minister of Security. It would help the Ministry immensely if you could hand it over at once. I completely agree with your thoughts. We cannot fight the Russians and Germans at this point, with many of our provinces in rebellion. The rebels must be brought back into the fold before we can turn to the Russians. A clerk comes over to Alexios and passes him some notes. He nods and stands up. “In these trying times, I have ordered the Ministry of Education to institute an oath of fealty to be spoken at the beginning of each day, whether at school or college, to bolster unity and to focus our prayers on the actions of the Emperor and the Boule. It is a simple line, to be spoken in Greek, merely, ‘One God, one Emperor, one people’. “As such, I would hope that the Ministry of Labour would implement this oath at any training session held at places of employment as well, for we cannot have any old Thomas, Michael or Isaac declaring an independent state where once Roman hegemony ruled, and we should take pains to remind all true Romans of this fact, whether at work or at school. *Communication from the Sixth Legion has ceased. Chairperson, news from Britannia. The Sixth Legion is no more, the Isles are free from Imperial presence. We await news of whether the Senator has managed to escape of perished with the Legions. Excellent, I understand that the Burgundians allowed the Legions to escape, hopefully the French Workers Army will quickly overwhelm the fascists in their wars and our combined power will continue to grow. Please make sure that our production facilities throughout the region are operating at full capacity, even if we just have to arm every man, woman and child then as long as the workers yearn to be free they will not break us. For the Revolution! “Repeat yourself, you’re breaking up,” said Ioannes Dalassenos over the telephone. “Identify your location,” said Dalassenos. “We–are–AAAAAHHHH!” The line cut off. Dalassenos slammed down the phone. Other operators worked to get a connection back up, but Dalassenos knew that there was nobody on the other side who was going to answer the call. The condition of General Palaiologos is still unknown but it seems that General Solanis has been slain. How is this happening? Why is this happening? We have given so much to the provinces and they want independence? How is this happening? They have clearly been corrupted by the Cult. They murdered my father. They murdered the Emperor. My reports tell me they helped negotiate the Northern Alliance! Our legions reported finding Cult equipment and propaganda within rebel-occupied territory! How can you not see the big picture here? They have been planning this for a long time. Now of course I don’t blame them for anything and everything without a reason, but I have a reason right now! You’re right. There is no way, logistically or ideologically, they would be able to incite rebellion in Oceania or Britannia; after all, Britannia has embraced communism and Oceania is half a world away from us. However, I never said that the Cult was ever supporting all rebel groups. I apologize for being unclear. I guess I’m still trying to get over the loss of my father and brother. Nestorius nodded in response. “I doubt anyone can criticize you for still being emotional. We can relate to having lost someone dear,” he said in a staid tone. I assure you, we will find them and bring them to safety. The Empire leaves no citizen behind. Agreed. Now, anybody know what is going on in the Middle East? 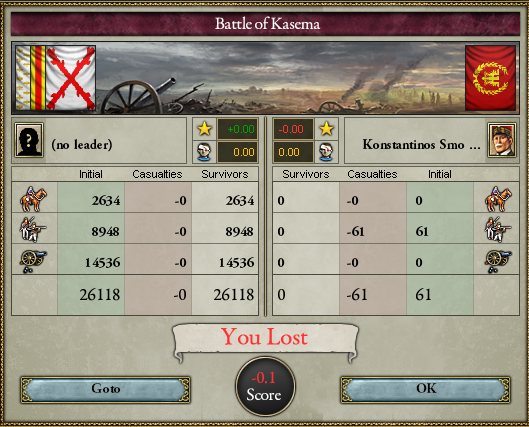 The rebels in Jerusalem are the weakest and potentially the easiest to defeat. As the Senators’ conversation drew to a close, the Emperor spoke again. Senator Doukas, may We see the letter before the ministry does its full analysis? Interesting, it seems to be a repeat of the Donation of Constantine, with Burgundy supporting Italy. No doubt these two, being the rebel nations with borders to the Empire, plan to expand into any land they can claim. We shall see about that. Senators, We thank you for your time. We will summon you again when there is more news. On the fourth of June, We received a report that XII. Legio—in Kasema, a province in Central Africa—had been completely defeated. The majority of its regiments, being from Aquitaine, Catalonia, and Spain, had declared for their respective revolutions and attacked the loyalist regiments. They immediately turned to fighting among themselves, and We are uncertain what their plans might be afterwards, being so far from their homelands. Meanwhile, the survivors of X. Legio were attacked in Bruges while waiting for a transport fleet to pick them up. With all transport fleets still several days away, their survival began to look precarious. And on June 6th the North Sea Fleet, which sat impotently off the coast, reported that the Legion had been completely destroyed, with only a few of the command staff sneaking off to sea during the night and being picked up the fleet. Fortunately, XVI. 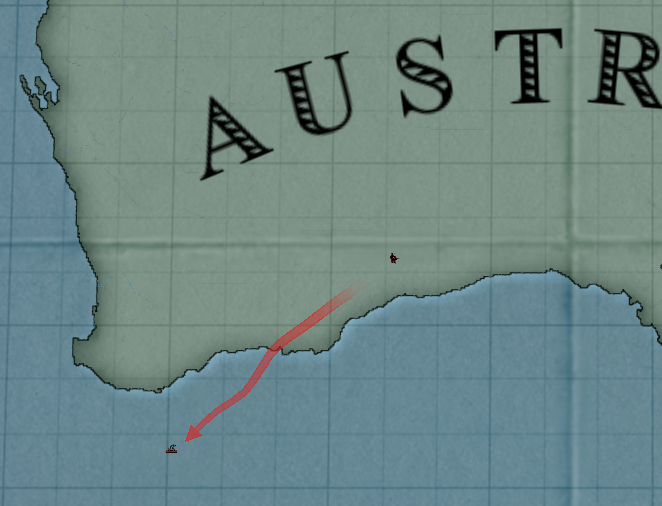 Legio in South Africa survived their battle with disloyal regiments and marched for the coast, where the Africa Transport fleet is waiting to pick them up. And even better news came from Guyana on June 8th. XXV. Legio had defeated their rebellious regiments, and were in pursuit to completely destroy them. While We are still reacting to immediate events, it looks like matters are beginning to stabilize. Therefore, We have drafted an initial plan for fighting the rebellion. All legions in or near rebel territory will withdraw to Dalmatia or Naples, or where a transport fleet can conveniently drop them off. They will rearm and recruit replacement regiments. The stronger legions will continue to fight the Jacobin, Reactionary, and Communist rebels, fight any former legionary regiments within these borders, and hold the borders against further incursions. If need be, then We will create borders further back. We will also recruit new legions as We are able to secure recruits. However, We wonder: what does the Senate think should be done regarding legions that have fallen in this rebellion? In the past, their number has been retired entirely. But so many legions have been lost. As well, there are many legions that had been split into multiple fighting groups. We plan to make each of these fighting groups a legion in its own right. Perhaps they can be attached to the few survivors of fallen legions, essentially reconstituting the old? Or do the Senators have other ideas? And finally, all these plans may soon change, as the Northern Alliance has expanded yet further. The loyalists in South Africa deserve the highest of honours. Three thousand men, all part of an artillery brigade, fending off five times their number is truly remarkable. This Northern Alliance worries me. Who are they allying against and for what purpose? I can only assume they wish to take advantage of our state of weakness, for long have the rest of the world been jealous of our success and power. 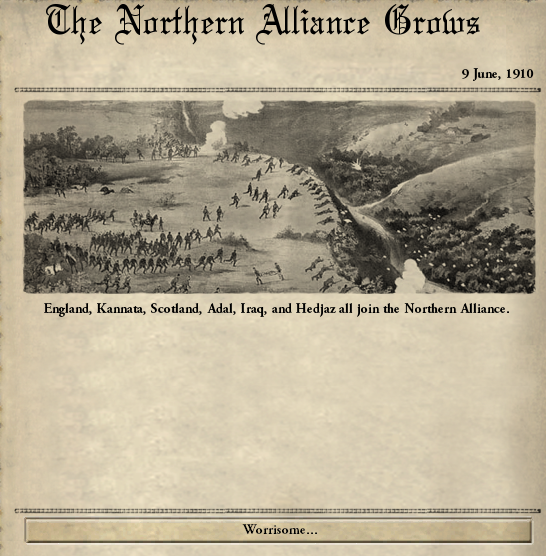 The Northern Alliance is quickly becoming a major threat to the Empire. We must deal with the rebel scum as quickly as possible so we can deal with Russia. For ease of communications, I would support making each army a legion in its own right. This would boost their morale and make it easier to identify each unit. “The expansion of the Northern Alliance is distressing. We’d face a 6 front war if they declared on us now,” Nestorius thought aloud. “However, in these times, it is great to hear that more and more rebel regiments are being defeated,” he said, as he thought of something. He turned to Hairini. I would recommend integration of several divisions of armor into each legion. These tanks show promise and potential. I fear that if we rely on sheer manpower too much, we could run into problems of the Northern Alliance begins using armor divisions. We must create legions consisting entirely of armor and use them to assault rebel positions with impunity. This way, on the battlefield we can quickly and decisive overwhelm our enemies with minimal casualties. What should we do with the Empress Veronica, which as you know is the militarized and renamed La France airship? Should we send it on reconnaissance missions or bombing runs? And where should it be deployed? The former Senator Gael has let us know that further nations seek to rip the Empire apart, we will have to be the jackal to their lion. Allow the Capitalists to fight amongst themselves and we will take the scraps. As long as we can maintain peace between the Marxists in the UK, the Anarchists in France and ourselves we will be able to grow our forces and subdue the neighbouring fascists. Soon we will be powerful enough to take the fight to the rotting corpse of the Empire! And the bombs fell all across Paris, flattening block after block of building and sending communists in all directions, scampering for cover as the Empress Veronica soared overhead in all of its imperial glory, utterly unopposed by any rebel forces. This is quite worrisome. Tanks seem like an excellent solution at this point. What was the population before the…. what should should I call them? Scum? Traitorous A**holes? Rose up. Then maybe we could define the population of each area and figure out how much men they can call up. As at previous sessions, the Emperor waited for a lull before speaking again. Australia and Aoteorea both have not made any sort of contact with the Empire. The various technicians insist the telephone cables are intact, so We can only assume they are choosing not to send any messages. The few bits of information gathered from radio transmissions suggest Aoteorea has fallen sway to reactionaries, led by a single dictator. XI. 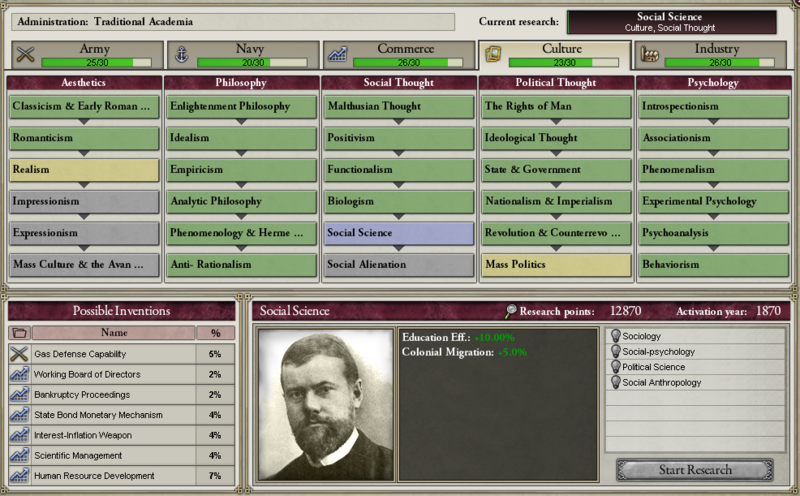 Legio had intelligence suggesting Australia has fallen sway to ‘Anarcho-Liberals’, which seem to be a cabal of businessmen. We will hold another meeting when We again have new information to share. It is as we all feared. 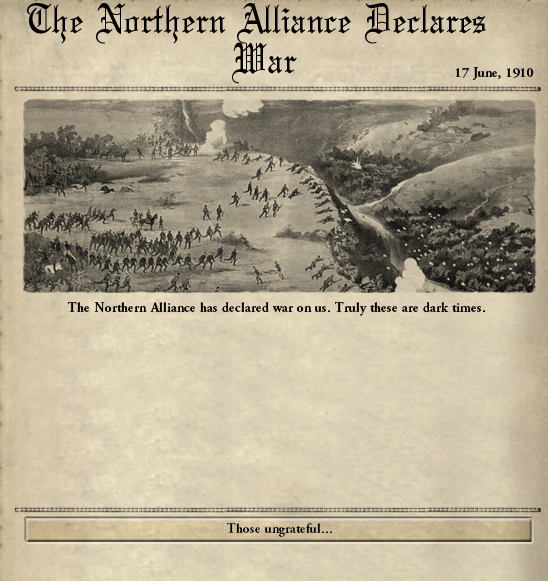 The Northern Alliance has declared war on the Empire and its allies. However, before We review the details of this new war, let us discuss the events of the past week. On 11 June, XXXV. Legio sent its rebellious regiments into retreat. It abandoned its former plan to clear the Greater Congo region of Jacobin rebels until it could recruit new men into its depleted regiments. Instead, it chased the survivors of the disloyal regiments to Kribi, where they were completely destroyed on 13 June. XXXXIV. Legio had cleared Naples from all other rebels, so attacked an Italian army in Bologna on 12 June. The battle is not yet decided. XXIX. Legio had waged a desperate defense against Jacobin rebels after most of their regiments had declared for Italy and abandoned them in the midst of battle. They were preparing to break out and escape the battlefield when the rebels instead routed. Nevertheless, XXIX. Legio retreated to a more secure location. XVI. Legio successfully extracted from South Africa, their transports immediately sailing for the Mediterranean where they would be sorely needed. We begin to question the integrity of the press. No, no, Senator Doukas, We will allow them to continue to freely publish without harassment. But do check to see if this is the result of outside influence, and if so, what that influence might be. 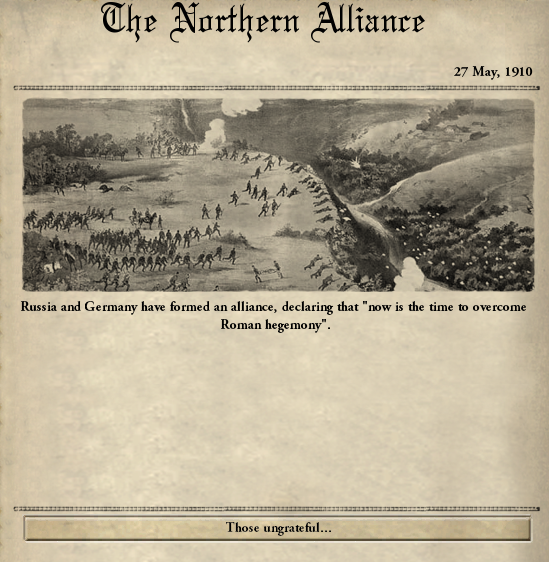 So now, the war with the Northern Alliance. This map shows the extent of the allies willing to aid the Empire, and the extent of the Northern Alliance. We believe the former plan to withdraw the legions to the heartland of the Empire is still sound, though holding the borders with the Northern Alliance may be difficult. We hope to reclaim rebel territory in order to allow ourselves to recruit more legions to fight the greater war, but the next few weeks will show the viability of that plan. 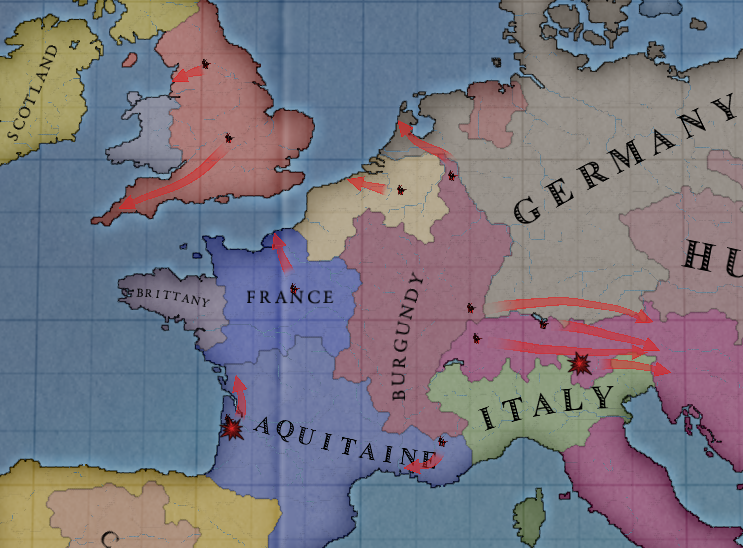 “Germany is our natural ally,” say the French. We should bring up the matter of Alsace-Lorraine with them. Those barbarians in Russia and Germany! For the second time in the Empire’s history, the barbarians are invading us! We must rally all of our troops to defeat them and put them in their place! The Ministry of Security is getting in touch with subversive units such as radical communists and fascists within Russia and Germany to see if they can help us bring down our enemies. Of course, I shall only give the green light on your command. I regret to inform you that General Palaiologos is dead, killed in action in Britannia but apparently, a misprint on a letter has caused Rome to believe the Sixth Legion has been destroyed. It is instead, the Tenth Legion that has been destroyed. I, Paulinas Palaiologos, will carry on my father’s legacy. I hail from Britannia and escaped the vile communist forces there. I may be young, only 29, but I know what is best for this Empire. I request to lead the Tenth Legion against any forces that may seek to defeat Rome. We may be outnumbered but we are Roman, not the barbaric scum that call themselves nations. The news of Australia and Aoteorea’s rebel governments was of concern to Hairini. She worried for her family’s safety, because of her working overseas for the Empire. Following the session, Nestorius tried his best to calm Hairini down, assuring her that her family should be fine. However, she wouldn’t take it; she needed to contact them by telephone, as she had bought them one a few years earlier. At their residence, she made the call as Nestorius stood by her side. She waited for a couple of minutes, nervously waiting for an answer, before getting one. Nestorius’ head was in his hands when he heard that the Northern Alliance had declared war. Hairini, knowing what this meant for the Oceanian states, looked as though she was about to scream her head off. The Empress Veronica shook as something hit it. An officer screamed as bullets smashed through a nearby window, striking metal and flesh with extreme prejudice. “What the hell…” said Laskaris. A small and dark shape shot past the bridge with a loud hum, and briefly John-Loukas could make out the shape of a hammer, sickle, and Britannian Union Flag. The British had airplanes too. Klaxons blared all throughout the ship as the crew manned their stations, among them the two rudimentary antiaircraft guns. “Find that plane and shoot it down!” ordered John-Loukas. “Uh, Captain, I think we have a bigger problem than one plane,” said Laskaris, pointing in front of them. Out of the clouds emerged a large airship, painted in all red, bristling with weapons all over. It was of the same design as the Empress Veronica, but it was twice as large and significantly more armed than the imperial ship, with five more light cannons and three more antiaircraft weapons, as well as what appeared to be a larger bomb bay and…a runway? John-Loukas swore he saw planes inside, getting ready to take off. On the side of the communist airship was written: Aiden Gray. “Sir, they are hailing us over the wireless,” said the communications officer. “Patch them through,” said John-Loukas. “Yes, I ordered that,” proclaimed John-Loukas. There was no response for five seconds. Then there was a laugh. The Aiden Gray opened fire on the Empress Veronica, unleashing a devastating hail of flak from its cannons as its complement of biplanes strafed the imperial ship, tearing large holes in the sides of the Empress Veronica’s hull. The ship rocked from the sheer force of the impacts. Some crew screamed or lost their balance and were tossed overboard. Others bravely tried to man their stations. “Seal them off and execute Protocol Herculean,” ordered John-Loukas. “I hate to say this, but if we wait for them the flames could reach the hydrogen, in which case we all die! So do as I order you to do, and execute Protocol Herculean!” shouted John-Loukas. “As you wish.” The officer turned a key on his console. There was a rumbling as thousands of gallons of ballast water were suddenly released from their holding chambers, rushing through the lower regions of the ship and dousing all flames. Looking out of the corner of his eye, John-Loukas saw water cascading out of the exhaust pipes and gaps in the hull, carrying with it all forty flailing crewmen over the edge into the abyss that was the sky. “All fires accounted for,” said the officer. “Very well, get engines one and two fully operational!” ordered John-Loukas. John-Loukas leaned over. “I wasn’t saying we retreat,” he whispered. Laskaris gunned the throttle, and the Empress Veronica lurched forward, towards the port side of the Aiden Gray. The Empress Veronica rammed into the side of the Aiden Gray, and both ships tumbled from the heavens, towards the earth below. Nestorius takes his head out of his hands and looks at the other senators. He knew he would have to share the info he had gathered from Hairini and decided to just do it. He stood up. “If you all don’t mind, I would like to share some info I had gathered from a source regarding Australia and Aoteorea,” he said. “As we know from last week, Aoteorea is ruled by a dictator, while Australia is ruled by what seems to be a cabal of businessmen. According to my source, both parties, the Aoteorean dictator and the Australian businessmen, are natives of their respective islands; Māori and Aboriginal Australians respectively. The Aoteorean dictator goes by the name of Tane, and his dictatorship has been instituting some fairly shocking rules. His forces routinely check those who have some connection to the Empire,” he said as he gave Hairini a glance, “as well as enforcing segregation for non-Māori people, whilst differentiating between newly arrived immigrants and settlers from non-Māori born on the island itself. They spoke of depressing ghettos. And, according to my source, some of their policies are being borrowed from the Australians, who are reportedly even worse than the dictatorship. By the way they spoke of the rumors they had heard, non-Aborigines people are even worse off there,” he revealed in a worried tone. “It may not be much, but I knew this info had to be shared,” he stated, as he sat back down. Hairini looked at him worryingly. She hoped that the info would vivify at least one of the senators. Oh dear, Racism? Excuse me for a moment everyone, but cover your ears or leave the room if you don’t like loud noises. “Julius, the cult has influenced many people and many influential people has convinced the citizens to rise up-” Senator Doukas began. “SO WHAT! OUR PEOPLE ARE SUPPOSED TO BE EDUCATED,NOT A BUNCH OF PEASANTS! IT’S SICKENING! ALL MY LIFE I HAVE BELIEVED IN THE ORDINARY NATIVE TO SEE LIGHT AND ASSIMILATE INTO ROMAN CULTURE PEACEFULLY, AND THAT HAS ALL BEEN SHATTERED! AND WHAT ABOUT CHINA! THOSE BASTARDS HAVEN’T HELPED US ONE BIT, THANK GOD THE UTA HAS JOINED AGAINST THE NORTHERN ALLIANCE, THOSE UNGRATEFUL BASTARDS. WE HAVE BOUGHT LIGHT AND TECHNOLOGY TO A DARK EUROPE AND THIS IS HOW THEY REPAY US! I once met an Australian family while travelling in Australia when I was 16. They were nice people, offered me food and water and helped me to Sydney. They believed in the empire, and wished for it’s eternal life. Now, after all these events,I am shattered. Hairini, I apologise for all these events regarding your family. Hopefully, you will find them. Now, let us crack some skulls, shall we? Nestorius and Hairini were both blown away by Julius’ reaction to the news. They didn’t expect that kind of vilification, especially Hairini. She spoke; “T-Thank you for your kind words, Senator Marco,” she said nervously, “but you must remember that many immigrants and settlers who come to Oceania are racist as well. Regarding education, I would be willing to bet that those in power there currently are highly educated and are using their intelligence to take power. We natives want to assimilate, to consider ourselves Roman, but with how we are treated, we end up assuming that you don’t want us to be that. In fact, that’s what I feared the most when I started working overseas, but I am relieved to have experienced a lack of racism in my time in Europa. I was humbled by your kindness,” she told the senate. “And I doubt any Cult is involved in Oceania; most natives follow either a syncretic faith, combining Christianity and their local beliefs, or just Christianity outright. And because of the aforementioned racism, I doubt any native asking for independence would ask help from people not their own race,” she explained. Nestorius spoke up; “And one has to ask; what is truly Roman? We may be Romans now, but in the times of antiquity, the Romans were Italics who ended up conquering the land we stand in now. They brought the culture of the ancient Greeks into their own, syncretising it with their own. Perhaps we should do the same too. I mean, if it weren’t for this fact, then how did Gaul, Iberia and other such territories allow themselves to be enveloped by Greco-Roman culture?” he asked the Senate. Julius. This kind of sentiment is the reason we are in this mess. Instead of working with each other for the benefit of the Empire, we are arguing and even killing each other over racial differences! If we are to survive and save the Empire, we must work together. Keep in mind that the Old Empire fell when the people failed to work together to oppose the barbarians and instead killed each other. We must not let that occur again! Calm down, because if we fall apart, the Cult could bring us all down by exploiting our rivalries, and then we will all die. Okay…Yes.. thank you. I apologise for my outbreak earlier. Speaking of which, I think something here is odd. God loves us, yes? He punishes sinners, does he not? Then, pray tell, why is he allowing this? Hell, why did god even let catastrophe’s in the past happen! The bible says love thy neighbour, and treat everyone as you wish to be treated, and that hasn’t stopped prejudice, or hate. Also, what is religion? Believing in a god, but the religions just interpret it differently. My suggestion: withdraw as many legions to the borders and hold the line there, while other legions try to defeat as many rebel factions as quickly as possible. Once at least the European rebels are defeated, we can focus on defeating the Northern Alliance (this means probably abandoning Australia and Aoteorea for the time being, my apologies). Hit Germany and the Central European members first, then go after Russia. But it’s up to the Emperor to decide what to do. How much men can the russians pull up, and what is their equipment? I would like to think we have superiority in the equipment field. We do not have enough Legions to even attempt an offensive that has a reasonable amount of success. We must mobilize every single able bodied male in this Empire and rush them to the borders. We will have to abandon Italia, land to the East of Romania, and land north of the Caucasus. Guyana must also be given up. With the shorter lines, our decisive advantage as the defender in home terrain will show and we will take down 10 enemies for each Roman. Africa will be easily subdued as will North America. India, this time, is a useless ally as their navy is too small to transport their armies to where they are needed. I never advocated for a primarily offensive strategy; I only advised that we withdraw all of our legions to our own borders to hold off the Russians, while on the side we send a few legions to defeat the smallest rebel factions. I hope that clarifies everything up. We simply do not have the men to do what you propose. We must mobilize, shorten our borders, and hold in defensive terrain. We do not have enough troops to simultaneously bring back into the fold some of weaker rebel factions while holding off the Northern Alliance. We must wait for India and the UTA to come reinforce us. Abandon my family’s vineyards to those rebel scum? I’ll march into Italy myself and take them out single-handedly before I see my family estate touched by those traitors! And to even suggest letting Rome fall is absurd. Even with our capital at Constantinople, there is no Roman Empire without Rome. 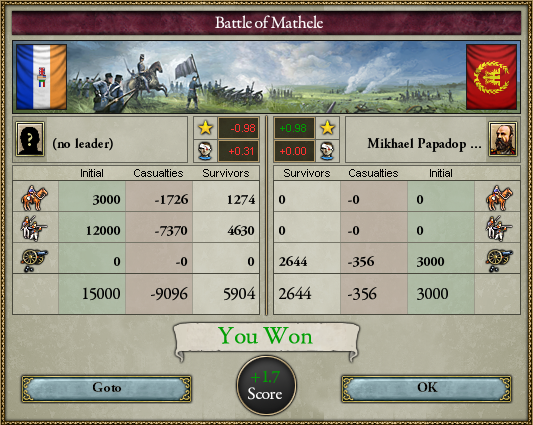 There will be no Roman Empire without victory in this war. We must do what is necessary to win this war. Are you calling the Eastern Roman Empire unroman? How dare you insult our ancestors! If we do not shorten the land we need to defend, we will be crushed in this war. For the greater good. Give our ancestors are dead, it would make more sense for us to survive instead of attempting and failing to keep their estates safe. So says the reactionary…ah, the hypocrites in this Senate. Order! Order! I will not having us giving in to petty arguments while we are at war! We are senators and Romans! We must unite together against the rebel scum and the Russian menace, or else we will all die! That speech was truly inspiring, Doukas. Our boys in the legions could use it. Here is a propoganda poster I am using to help recruitment. The Emperor was relieved that the near fight it the Senate had resolved itself. The last thing the Empire needed was disunity at this level. Senators, We thank you for your insights. It is still too early to make too great of plans, but We hope the situation will continue to stabilize quickly. We hope Our citizens will not suffer under these rebellious regimes for long, and that the northern barbarians will be thrown back yet again. We will hold a new meeting when there is more news. In the meanwhile, We will most often be found at the Hagia Sophia, where the Patriarch is holding continual prayer services for the Empire and its citizens. There has been much news in the past week. As might be expected, XXIII. Legio was immediately attacked by German forces after the declaration of war. Simultaneously, a German fleet moved to block the transports from being ready to extract the legion. The North Sea Fleet attacked the German fleet, though most of the German fleet slipped away. Both battles are still under way. XXIX. Legio had escaped to a safe location in Pannonia, when yet more of their regiments declared for Burgundy. XXVIII. Legio had hoped to rest and recover a little, but immediately moved to assist XXIX. Legio. Transports arrived in Quiberon Bay to extract VI. Legio from La Roche. They are expected to have fully boarded the transports by 3 July. On 22 June, Persia gave India military access, so India may yet be able to assist the Empire. Also on 22 June, XXV. Legio reported that they had completed destroyed all British forces in Guyana, making it secure for now. On 23 June, XI. Legio was dropped off on the Cocos Islands, and the transport fleet moved to rescue XXXII. Legio from Java. They are expected to arrive on 4 July. Thus far, We have not seen to much action from the Northern Alliance. There are scattered German forces in the Alps, and a Russian army in Stavropol, but no other forces of note in the heartland of the Empire. 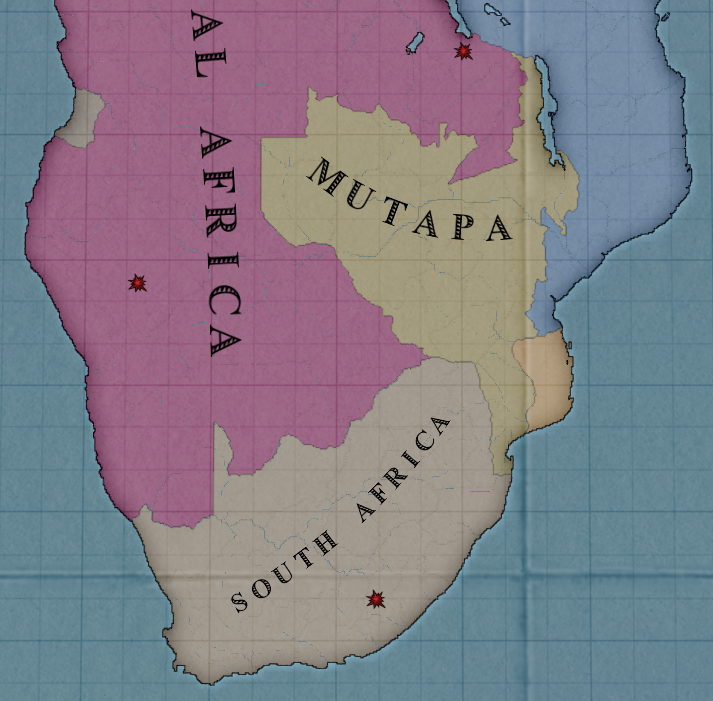 A few armies have left the Scottish and English colonies in Africa, but once the rebels are defeated, the local Legions should be able to fight them off. However, Ukraine is being attacked by both Russia and Poland-Lithuania. It is too early to see how this will go, but We are not confident. 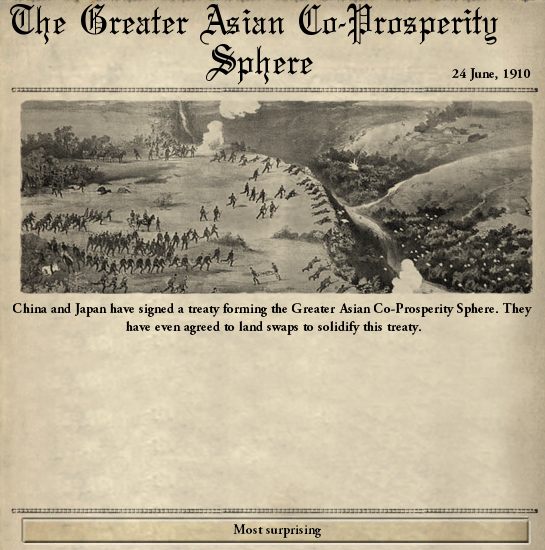 In potentially good news, Japan and Ming have formed what they call the ‘Greater Asian Co-Prosperity Sphere’, and even swapped some land to cement the treaty. We hope this may distract Russia. Gathered to listen to the Workers Beacon of Hope and Chairperson of the Workers Combined International Armed Forces – Layla Gray, daughter and granddaughter of the Senatorial Gray family, are representatives from France, Brittania, emissaries from the Northern Alliance and Greater Asian Co-Prosperity Sphere and the entire parliament of Brittany. Men and Women of the Revolution, I have received word from Paris that our superweapon the Aiden Gray has managed to bring the Imperial death machine to the ground. However it too has been lost and all on board as well. With sadness we acknowledge the martyrdom of those on board. However to business, we welcome our guests from the North and the East. Our proposal is simple that each of us hve much to gain with the demise of the Empire, we may have differing goals and our visions for the future vary but as my French counterparts have noted recently to the German ambassador until the threat of the Empire has passed we are all at risk of gaining naught but extermination. The threats and insults coming from the capital prove that if they had their way our cities would be torn down and our citizens enslaved or worse. Or proposal is simple, though no formal alliance will exist between the Workers Combine and either the Northern Alliance or the GACOS, we will not engage in hostilities and will allow passage of troops through our respective territories in order to better co-ordinate this war against the true enemy. The various workers parliaments have agreed so we provide you with the various agreements for you to take to your superiors for approval, with that if there is no other business you will have to excuse me as we still have battles to fight. 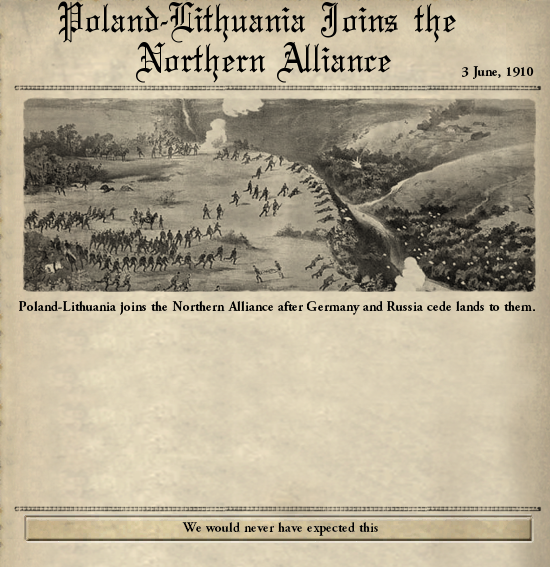 Again, there is not detailed news on the war front. 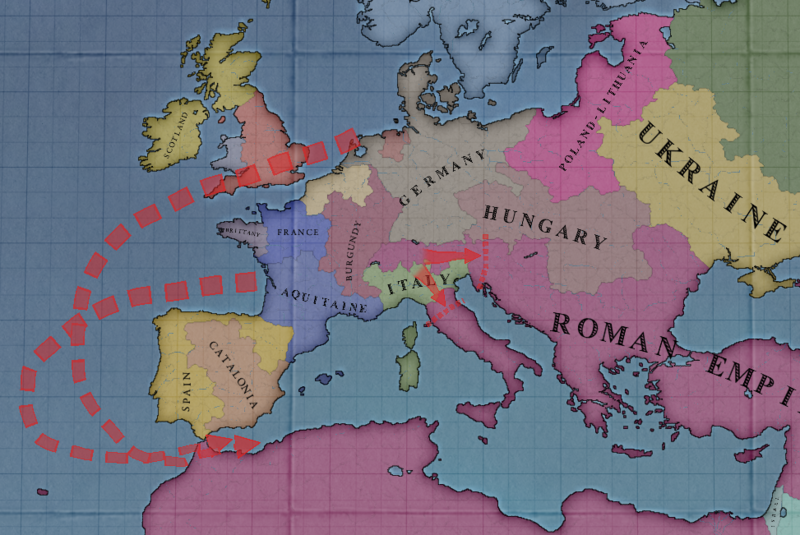 You should know that Italian incursions into Pannonia and Naples have been thrown back, but the legions now desperately need time to recover. Meanwhile, new incursions have begun. XXIII. 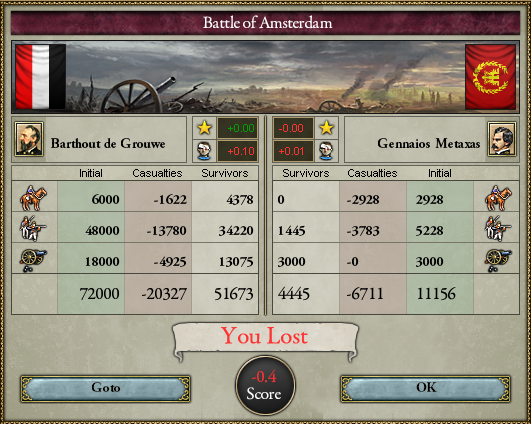 Legio made an excellent showing for themselves in Amsterdam, and should board their transport fleet by the fifth. The only legion still in danger is XXXXII. 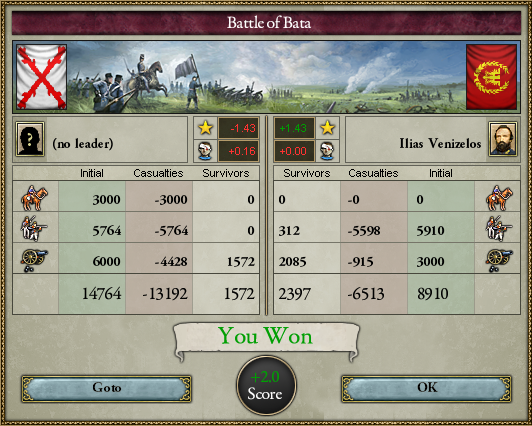 Legio in Batavia, and it seems there is a chance they might win their battle, despite the 60,000 enemies they have faced since the outbreak of the rebellion. Nevertheless, the South East Asia Transports will arrive on 4 July. 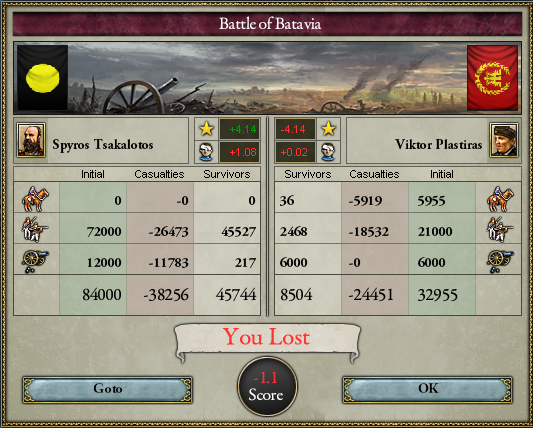 We fully expect Pannonia to be cleared of rebels within a week, at most, two. Once that is complete, recruitment of new regiments to bolster the legions in that region can begin. 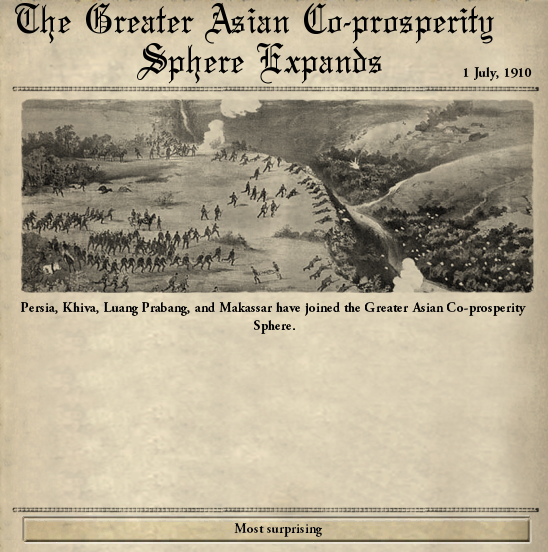 In world news, the Greater Asian Co-Prosperity Sphere has expanded. We now believe their interests will be opposed to both the Empire and the Northern Alliance. But what truly will happen is yet to be seen. Nestorius wasn’t really sure what to add to the conversations at the Senate. He wasn’t much of a military man, so all he could do was praise the victories and hope for the best. He was however getting worried over Hairini. She had been trying to contact her family once more, to no avail. She had lost that wunderlust she had back when they arrived in the capital; she had become a nervous mess disguised in a calm skin. Nestorius tried to think of something to reassure her that everything was going to be fine, but nothing came to mind. He was looking over the balcony on the evening of the 30th of June, watching the city stay awake as Hairini slept. All of a sudden, he got an idea. He knew that he always worked better as a governor than a senator, especially when the news at the Senate consisted mostly of military events. He decided to go through with his idea tomorrow. Nestorius stood up, ready to go through with his idea. “My Emperor, if I may ask something of you,” he started, “I would like to be assigned the position of Governor of Aeteorea,” he said. “I have learned much in my time as Governor of Naples, and I feel as though my abilities gained would allow me to serve as an able provisional governor,” he stated. “However, as I have learned, a governor by himself cannot run a governorship. Those who have worked under me in Naples are excellent at their jobs, and thus I ask for them to join me in the provisional governorship,” he asked him. Hairini looked at Nestorius in surprise. Christophoros Palaiologos has been confirmed to have died in Britannia. Paulinas Palaiologos has been assassinated by radical communists in the streets of Constantinople. I am the sole remaining member of the main Palaiologoi dynasty. Senator Septiadis, your request is granted, though We are not sure what you wish to accomplish with this move. It seems likely it will be some time before Aetoerea is returned to Imperial control. Senators, thank you for your time. As always, We will share further news as it arrives. This newspaper was released this week. The archivists consider it significant, so fresh copies have been provided to each of you. This week, XXV. Legio decided it would be better to wait for transport from Trinidad—where the Guyana Fleet could block any English armies—than from Guyana. They are expected to arrive on Trinidad tomorrow, but We still have seen no sign of English armies. IX. Legio, after helping clear Armenia of rebels, decided to strike for the heart of Azerbaijan. They anticipate arriving in their capital of Baku on 14 July. VI. Legio escaped to their transports and will be dropped off in Sicily to recover. XXXXII. Legio began a retreat for the transports that finally arrived off the coast of Batavia. Though the battle was ‘lost’, they proved the valor of the legions. The half of XXIII. Legio that had escaped to the North Sea made it to their transports, and will be brought to the southern shore of Anatolia. Once there, they will be reinforced and take up the numeral of one of the traitorous regiments. Our navies proved their worth as well. The Red Sea navy sank the entire Hedjaz fleet in their battle, and the North Sea Fleet has held off more than three times their number so that the half of XXIII. Legio could escape from Germany. We will probably send them to a friendly port to recover before the battle is over, but wish the transports to gain a little more distance first. We felt confident enough in the growing security of various regions that We began recruiting new regiments to restore the legions in Pannonia, Naples, Macedonia, Armenia, and southwestern Africa. 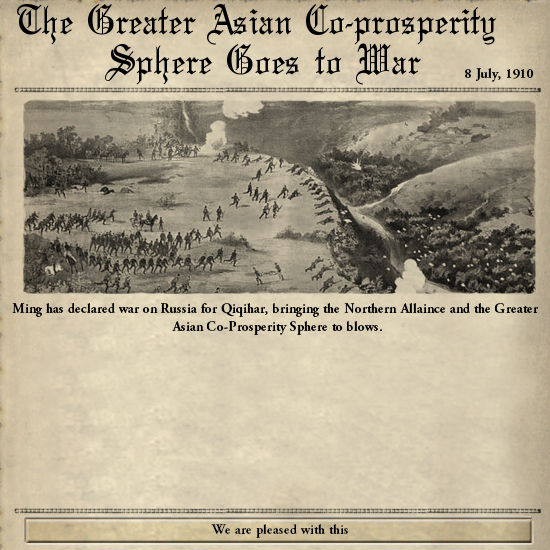 And in further good news, Ming has declared war on Russia, bringing the Northern Alliance and the Greater Asian Co-Prosperity Sphere to war with each other. This is a much-needed distraction. Now let’s hope they don’t get any ideas and attack the Empire. Following the session, Nestorius and Hairini quickly returned to their residence. “What was that about at the senate?” she asked him, still in surprise that he had requested the Aoteorean governorship. He turned to her; “As a skilled governor, I would imagine my services would be of great use there, especially after we get control of the territories once more. Plus, I’ve always wanted to go beyond Mare Nostrum,” he told her. While the reasons were sound, it was obvious there was another reason. Before she could interrogate him even more, he had moved to the telephone. He called the Neapolitan governorship. On the other side, one of his subordinates picked up. Nestorius explained the situation and told him to gather everyone, sans a few Neapolitans to keep the place in check, and to come to the capital as soon as possible. At that point, Hairini realized that the senator was going to turn part of their residence into a base for the provisional governorship. She attempted to object, but decided against it. Deciding she needed some fresh air, she left to explore the city some more. Not noticing she had left, Nestorius thought over if he should call up a few buddies of his to come and help him as well. He decided more hands would be best. The early morning before the session, Nestorius waited for his buddies to arrive. His subordinates from Naples wouldn’t arrive for another week or so, if his own trip here was any indication. Soon, they arrived. He went over to greet them with great big hugs, as he hadn’t seen most of them in years; Michail Lykidis, a politician from the town of Ulpiana, Stefanos Antecheirinidis, a linguist from the town of Aenona, Antiochos Heraklides, a childhood friend from the town of Dioclea, Nicolaos Alexidas, an old family friend from Singidunum, and Savvas Epimonopoulos, a theologist from Arsa he met in Naples a few years earlier. He trusted these men quite a bit. He brought them to his residence, where he introduced them to Hairini. He told them to get comfortable, as he and Hairini left for the Senate. The two sighed in relief after hearing that the Greater Asian Co-Prosperity Sphere had gone to war with the Northern Alliance. The thing the Empire needed the most was some relief and they had just got it. “It is great to hear that we’re recruiting new regiments for the legions. All help is welcome,” Nestorius commented. Thank god the asians and Russians are killing each other istead of us. John-Loukas Picardie suddenly opened his eyes and saw nothing but an empty blue sky, clouded by flames and smoke. He tried to move, but his entire body flared with pain, and restraints held down his waist. He looked down found that he was miraculously only bruised, with no broken bones as far as he could tell; not only that, but his chair was generally intact as well. The rest of his crew, though weren’t as lucky. Many officers lay prone throughout the wreckage of the still-burning bridge, some of them impaled on the jagged metal fragments that once made up the skeleton of the Empress Veronica. He unbuckled his seat belt and got up. Almost immediately he stumbled as pain flared in his left ankle. He wasn’t as lucky as he thought. At least he could still walk. Where was Laskaris? Where were his other senior officers too? They had to get out of here as quickly as possible and make it back to the Empire. Only God knew how much the rebels had radicalized the locals to communist ideals. He rounded a corner and stopped, spotting an equally ragged man wearing a rebel French Commune uniform. He carried a pistol with him, while John-Loukas was unarmed. While John-Loukas was a quite experienced soldier, having fought in Konstantinos’s Rebellion and served as a marine on the Empress Veronica, he was in no shape to fight this man. So he hid and frantically looked for something to defend himself with. Unfortunately, in his haste, he knocked over a piece of shrapnel, making a loud noise. John-Loukas remained silent as the rebel advanced towards his hiding place. Then a gunshot rang out, and he heard a thud. Warily peering out, he saw that the rebel was dead. “Hey,” somebody said behind him. John-Loukas recoiled so rapidly and instinctively that by the time he recognized Laskaris, he had a piece of sharpened metal well on its way towards the first officer’s neck. The two men hurried away from the wreckage of the two airships, towards where three other crewmen–who appeared to be Britannians and went by Leonard, Jonathan, and Brent–had hidden. Jonathan was severely wounded, with a large gash in his right leg. He needed medical attention urgently. “Okay, where to?” said Brent. “I don’t know, but we have to stay low and avoid the rebels,” said John-Loukas. “They’re onto us, move!” shouted the captain. The five men rushed out of there as quickly as possible. The clearing of rebels from within our heartland continues. The Bulgarian region is on schedule to be cleared of rebels within the next week or two. As such, new recruits for XXIV. Legio have been called up within that region. Likewise Egypt, where recruits are being called up for XIX. Legio and XXXVII. Legio, Tunis, where recruits are being called up for XVII. Legio, and Morocco, where recruits are being called up for XXXVI. Legio. 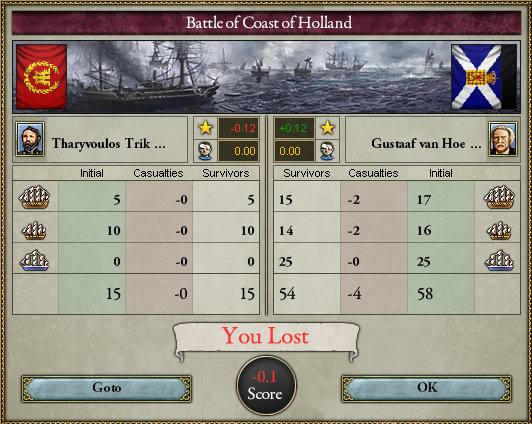 The North Sea Fleet has withdrawn in good order from their battle off the coast of Holland. 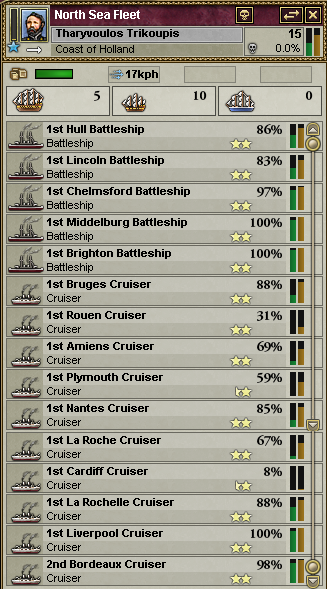 Though Germany is hailing this as a victory for them, they lost ships, while We lost none. Some of our ships are heavily damaged, and the fleet plans to undertake repairs at Lucca. 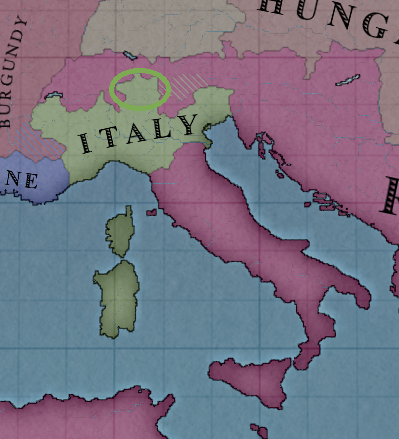 In bad news, Italy has seized the region of Chur and fully incorporated it. 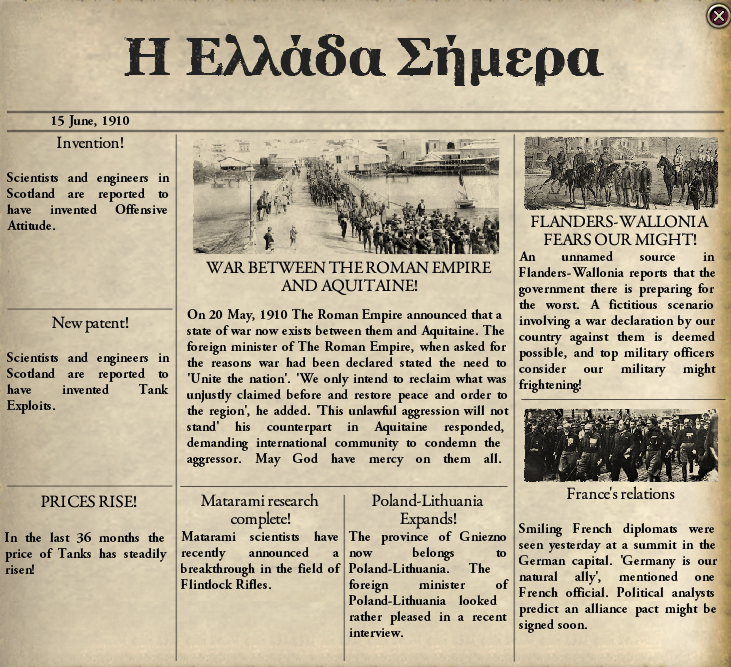 The entire region of the Alps is completely overrun, and We hope that it will take long enough to secure it that the reinforcement of the legions can take place and Pannonia defended. 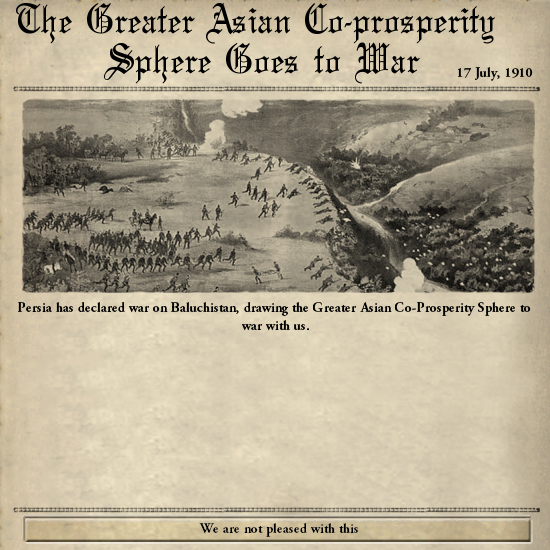 Likewise, Persia has decided to conquer Baluchistan, bringing the Greater Asian Co-Prosperity to war with the Empire and its allies. Truly this is a time of world war. Damn Persians, always stirring up trouble! They must be taught a lesson again! And what is the state of the front in the Middle East? Has Jerusalem been liberated yet? We MUST consider my uncle’s strategic plan! Without a solid defensive plan in place, we will lose this Empire to the forces of nationalism and revanchism along with a health bit of imperialism. Outnumbered by these numbers, we have no hope of attacking anywhere and winning! Senator Doukas, the front in the middle east has remain fairly static. Israel has sent an army north into Syria, as has Iraq, but this region is heavily fortified and their armies will not have an effect for a long time. The legions currently have no plans for retaking Jerusalem, but that may change once they are reinforced with new regiments. 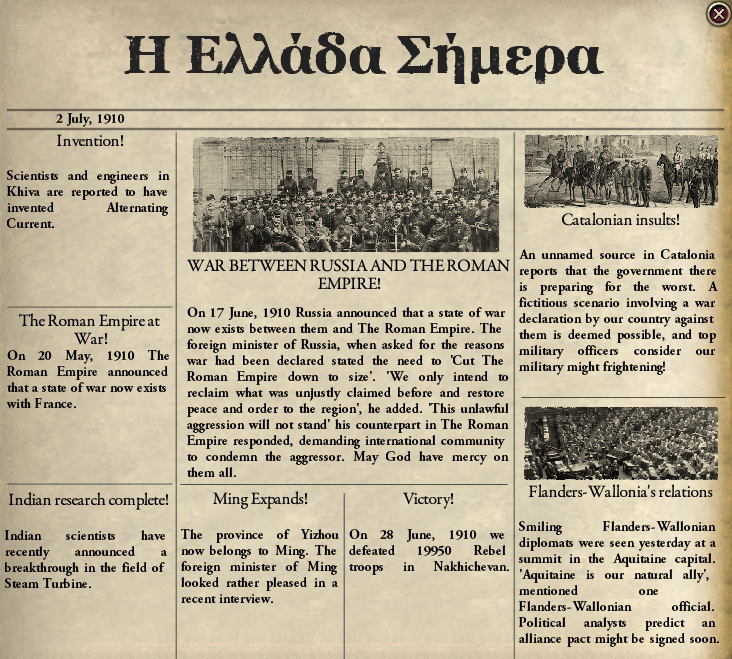 Senator Palaiologos, We agree with the plan to withdraw to defensive lines. The border of Pannonia in the west, and the Caucasus mountains in the northeast are the current planned lines. But We do not wish to withdraw too far, as that gives the legions fewer people to draw upon. And a full mobilization must wait until the Jacobins have been fully defeated, lest they slaughter farmers and miners waiting to form up. This entry was posted on Sunday, February 5th, 2017 at 3:04 am by idhrendur and is filed under AARs, The Empire Strikes Back. You can follow any responses to this entry through the RSS 2.0 feed. You can skip to the end and leave a response. Pinging is currently not allowed.